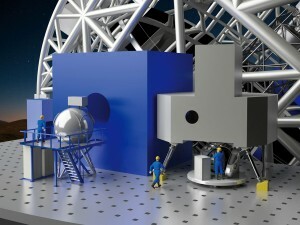 MAORY (Multi-conjugate Adaptive Optics RelaY) is one of the first light instruments for the European Extremely Large Telescope (E-ELT), the 39 m diameter optical-infrared telescope that the European Southern Observatory (ESO) will build in the next decade in collaboration with its community of member States. MAORY is a post-focal adaptive optics module. It supports the MICADO near-infrared camera by offering two adaptive optics modes: Multi-Conjugate Adaptive Optics (MCAO) and Single-Conjugate Adaptive Optics (SCAO). Development of the SCAO mode is a joint endeavour between the MAORY and MICADO instrument teams. The MCAO mode is required to achieve uniform adaptive optics compensation over the full MICADO field of view; the SCAO mode is required for peak performance, rather than uniformity over the field, when a suitable Natural Guide Star is available. In the MCAO mode, wavefront sensing is performed by a system based on up to six Laser Guide Stars for high-order wavefront sensing and three Natural Guide Stars for low-order wavefront sensing; wavefront compensation is achieved by up to two deformable mirrors in MAORY, which work together with the telescope adaptive and tip-tilt mirrors M4 and M5 respectively. In the SCAO mode, wavefront distortions are measured by a single Natural Guide Star wavefront sensor and compensated by the telescope M4 and M5 mirrors, while the deformable mirrors inside MAORY are kept flat. MAORY also offers provision for a second port for a future instrument, as yet undefined. The phase A of the MAORY project was completed in December 2009 in the framework of the E-ELT Instrumentation phase A studies sponsored by ESO. The international consortium that will develop MAORY from phase B (preliminary design) to phase E (commissioning) includes INAF (lead institute responsible for the design and construction of the instrument at system level) and IPAG (responsible for the development of the Laser Guide Star wavefront sensor sub-system). ESO is the project customer and is also a supplier of components for the instrument construction.